American trust has been shaken by a wave of high profile data and privacy breaches. 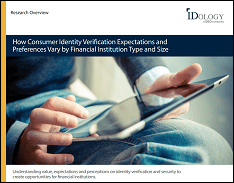 According to IDology’s Annual Consumer Digital Identity Study, 57% of American consumers are more concerned about the security of their information now than they were a year ago. This concern has eroded consumer trust in organizations that require access to personal information to operate. Americans responded with low confidence when asked if businesses, credit bureaus, or the government could protect their personal information. Additionally, 67% of consumers strongly believe it’s a company’s obligation to protect their personal information. This is where we can see a “trust gap”; only 59% of consumers believe it’s their own responsibility to protect their data. They expect more protection from companies than from themselves, yet they have no confidence that businesses can be relied on to do so. Before we can assess (and improve) consumer trust, businesses need to define what “trust” means for their company. Trust can mean different things to different people, so it’s important to clarify. Dr. Kent Grayson (professor, director, and co-founder of The Trust Project at Northwestern University) has done extensive research on trust. He divides trust into three building blocks: honesty, benevolence, and competence. To accurately assess how “trusted” a brand is it should be evaluated on each of these separately. This provide a more in-depth valuation of a company’s trustworthiness—for example, a company that is considered highly benevolent and honest but incompetent is very different from a company that is highly competent and benevolent but dishonest. This insight gives brands a better sense of which dials to turn and where to invest in order to achieve their corporate definition of trust. Learn more about bi-directional trust and what businesses can do to build trust with consumers by watching the on-demand webinar, “Defining Trust in a Post Breach Identity World”, featuring Kent and Chris Luttrell.